The 790 and 970 are the same circuits if the 970 is a later serial number. Earlier serial numbers were slightly different. If you have no power to the solenoid after the initial 1.5 second pull in signal, then I don't think the solenoid is the problem. The power for the hold in circuit is coming from the delay module. Since that is new, I assume that is good. The delay module has to get a signal from the seat switch, pto switch and gearshift neutral switch to operate properly. If all the switches are good and the delay module is good, then there must be a wiring issue or a bad ground. Make sure the delay module is getting a good ground and also getting full 12 volts. Low voltage can cause problems too. Is battery fully charged and alternator working? Thank you JDGreen for responding. Did additional testing today. Had resistance from ground on battery, cleaned, fixed, checked, ok. Tightened belt which was new last year. Checked resistance at trans neutral & pto switches, resistance-2. Rechecked seat switch, resistance 200. Got reading on one side of switch and nothing on other side. Left to right, not top to bottom, but we were unable to jump out switch, and make it start, ?. Again tractor will start if solenoid is held in. My electrician helper told me to replace the seat switch. Will order on Monday. 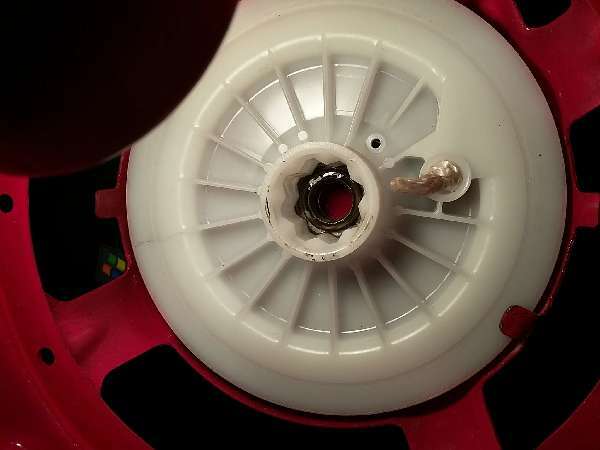 Dealer said seat switch good, but problem was gradually getting worse. They may have tested it when it was still partially or intermittently working. I doubt the seat switch is the problem. If transmission and pto is in neutral, you can start tractor without sitting in the seat. The seat switch keeps it running after started and transmission or pto is put into gear. Another thought has occurred to me. DO you have mid pto? If not, then there is a wire connector in harness on left rear side of transmission that would be connected to the mid pto neutral switch. When there is no mid pto, there should be a small loop wire plugged into that connector to bypass that switch that isn't there. If that wire got knocked off somehow or the connection is corroded, that could be your problem. 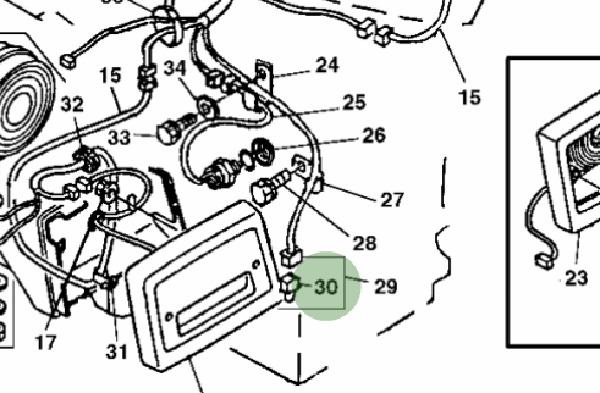 I am attaching a part diagram showing that loop wire connector, #30 in diagram. 970- still can't find problem. Today, checked jumper cable in back for unconnected mid pto. Checked out for continuity, also key mistakenly left on to the right and as I put jumper back in, solenoid was clicking in and out. Checked battery, fully charged at 12.02. Started tractor by holding in solenoid, read voltage coming into battery. Started out at 12.10 and slowly climbed to 12.40 over a span of 10 seconds till we quit checking voltage. ? I even spayed lubricant in key switch and used a new JD key to see if something could possibly not be making contact. Solenoid was jumpered out before and it started, but if need be I will jumper out as suggested. In case I didn't mention it before. relays tested and thought to be good and even switched the 2 same side front to back, no difference. don't know what the other 2 other relays or what ever they are next to the relays are for. I appreciate the help. 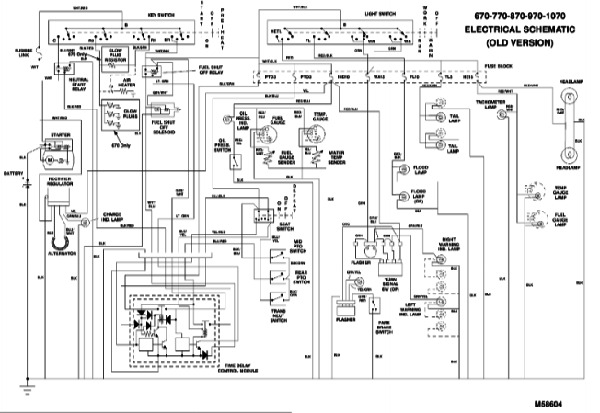 Here is a wiring diagram. Not sure if it is clear enough to be helpful.